Healthcare supply chain leader, Imperial Logistics, has unveiled a world-class expansion at its Centurion facility in South Africa. With more state-of the-art, pharmaceutical compliant storage space, and a new, faster picking methodology, Imperial Logistics is perfectly positioned to optimise its service to clients allowing us to get life-saving medicine to the people of Africa faster and more cost-effectively, states healthcare strategy executive Dr. Iain Barton. This expansion project kicked off in August 2016, with the demolition of existing buildings to make space for the redevelopment. “The main challenge that the project team faced was that Imperial Logistics had to stay operational 24/7, 365 days a year throughout the entire project duration. Being in the pharmaceutical industry, service levels with existing clients had to be maintained,” Barton stresses, adding that unwavering health and safety regulations were enforced in areas that remained operational, and it was also critical to protect stock worth more than R1 billion. This redevelopment project consisted of the construction of a 9 000m² very narrow aisle (VNA) warehouse with a height of 25.5m to the eaves to cater for the storage of 30 000 pallets, a dispatch hall with 10 doors with dock levelers, a high-tech 8 000 parcels per hour shoe sortation system, and a 928m² bonded store with space available for 1420 pallets. More than 680 tons of structural steel was used in this phase. 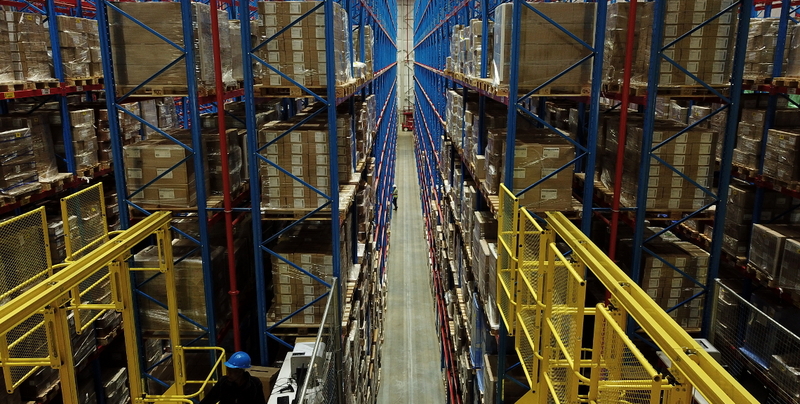 Barton explains that a very narrow aisle or VNA is a term used to describe a warehouse design that consists of standard pallet racking or APR with picking aisles not more than 2m wide and storage heights ranging from 13m to 19m. Specialized material handling equipment is employed to service each pallet location, and Imperial Logistics sourced VNA turret trucks from a world leading material handling equipment manufacturer in Germany. “It was imperative that the design also included spill containment in the event of a sprinkler system discharge, as well as an HVAC system to ensure temperature levels within the warehouse remain constant between 18ºC and 25ºC,” Barton states. The fire suppression and smoke extraction system to service Imperial Logistics’ new VNA warehouse includes water storage tanks with a storage capacity of 775 000 liters, 12 000 sprinkler heads and smoke extraction fans capable of extracting 84m³ of smoke per second from the building. Various green initiatives were also implemented, including LED lighting that will achieve a total energy saving of some 30% per month. A challenge faced in designing the new VNA warehouse was to ensure that the floor construction adhered to the strict requirements set out by various international standards authorities, to ensure that the specialised materials handling equipment functions properly in the picking aisles. The floor flatness was not the only concern as the entire site had geotechnical restrictions, Barton explains, noting that this necessitated a unique approach by the team. Now that phase one of the Centurion build is complete we have moved our sister company Pharmed onsite creating a 2-tiered offering of distributor & wholesaler. Pharmed is a complete healthcare provider, focusing on bringing reliable, effective solutions to independent healthcare professionals throughout South Africa to the benefit of the end patients. “Our business needed additional capacity following its diversification into the pharmaceutical wholesaling, medical devices and animal health markets. We now have room to grow, and to expand and enhance the unrivalled healthcare capabilities that we deliver,” Barton concludes.